Several of the papers deal with providing incentives for carsharing users to achieve various goals, for example relocation, increase utilization. Here are several that look interesting and a section of the abstract that caught my eye. ...The objective of this study is to establish FFCS customers’ preferences for each of four incentivisation mechanisms: 1) vehicle delivery, 2) paid relocation, and 3-4) incentivisation for alternate vehicle pick-up and drop-off locations. Survey data from FFCS users in Vancouver and Washington D.C. are employed to quantify willingness-to-pay/accept (WTP/WTA) for these mechanisms. We find that a majority of respondents report positive attitudes toward each of the four incentivisation mechanisms. Regression analysis shows that user experiences using FFCS are generally stronger predictors of WTP/WTA than socio-demographic features, with (intuitively) the frequency of FFCS unavailability the strongest predictor. Yong Jin, Global Car Sharing & Rental Co., Ltd.
Ting Li, Global Car Sharing & Rental Co. ...The reward policy and the ranking method were tested in real operating environment of an electric vehicle sharing system in two districts of Shanghai. The result suggests that the reward policy with ranking method could shorten the vehicle idle time and increase the number of transactions per vehicle and per station, and also resulted in increments on profits. ...Car sharers were classified into five categories: car dependents, car avoiders, second car avoiders, car aspirers and car sellers. Key findings suggest that car sharing motives and impacts vary greatly for all categories. Car aspirers and car sellers report the greatest changes in mobility choices (car ownership) and travel choices (use of a car, public transport and active modes). ...Shared mobility, particularly sharing rides, cars, bikes and scooters, is having a transformative effect on cities. Understanding what operational considerations affect the implementation of shared mobility services is critical to their success. This poster session explores several factors for consideration in the implementation of shared mobility in the transportation ecosystem. Comparisons were made for both one-way and round trip services. Possible costs of parking a private car were not included in the cost of ownership. 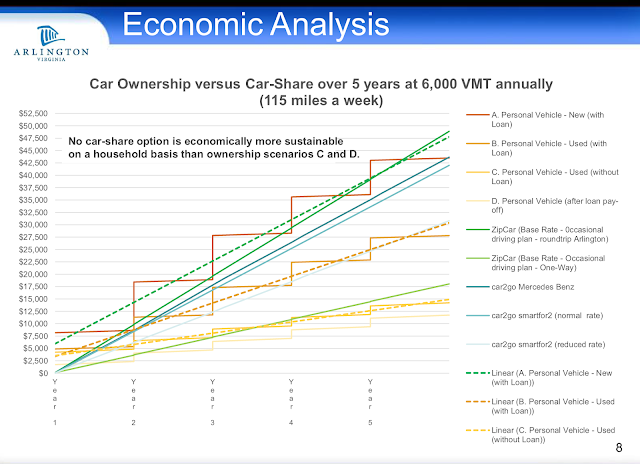 Under 2,000 VMT annually, car-share appears the most economically efficient on a household level. Over 6,000 VMT annually, car ownership is, in almost all cases, economically more efficient than car-share. Car-share services are best used as regular first-last-mile connectors and for infrequent trip taking. Arlington residents owning more than one vehicle or considering buying their first vehicle are most likely to realize considerable savings by using car-share. The county's main carsharing web page describes the partnerships with carsharing companies and has links to additional details of the study, including the cost assumptions that were used in the comparisons. 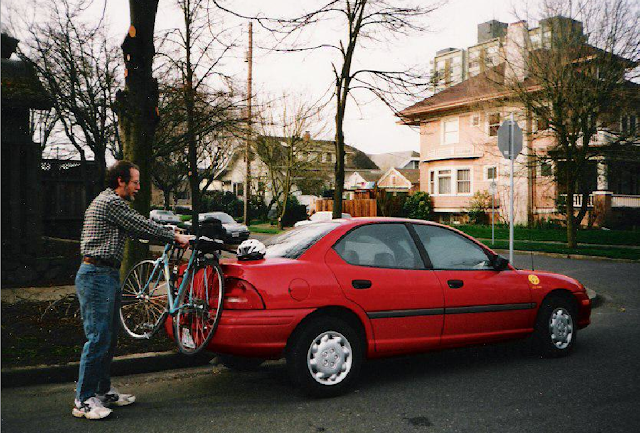 This is a short chronology of CarSharing Portland and the start of carsharing in the US, based on announcements in CSP member newsletters and other documents. VW Beetle); these articles had significant influence on Dave Brook. Various articles appear in US newspapers about carsharing in Europe during the decade. 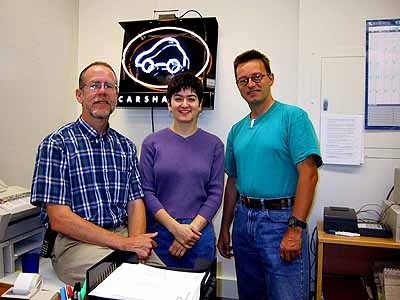 February 28, 1998 official launch of CarSharing Portland Inc.
April 2nd. Carsharing has come a long way since then. 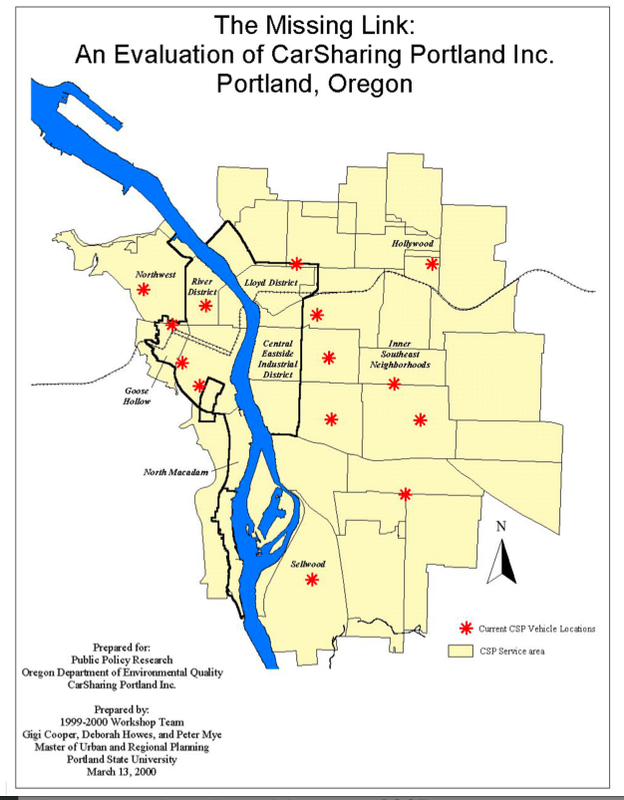 I'll be posting a timeline of CarSharing Portland (CSP) soon and am planning a series of posts describing the founding and activities of CSP. To get notified when they appear, subscribe to this blog (link in the righthand column). Nina DeConcini, Oregon DEQ tells a story about getting carsharing through the state bureaucracy. Others in the picture include (from left: Russell Martin, first General Manager, Jerry Zelada taking pictures, Maren Souders, Outreach and Customer Service, Dave Brook, Founder of CSP; Rex Burkholder, then with the Bicycle Transportation Alliance and co-author of the feasibility study about carsharing; Nina DeConcini, then (and now) with Oregon Dept. 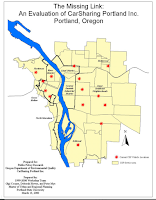 of Environmental Quality; Steven Scott, MetaResource Group, a co author of a bausiness planning study; Chris Hagerbaumer, Oregon Environmental Council; Francie Royce, then with the Portland Dept. of Transporation. Dave, Maren Souders and Russell Martin - the CarSharing Portland crew. Long time carshare advocate, Steve Gutmann, shows one of the signs from the original carsharing office. Todd Boulanger, then with the City of Vancouver, Washington's transportation department, shows two no parking signs from the first on-street parking space reserved for carsharing vehicles. 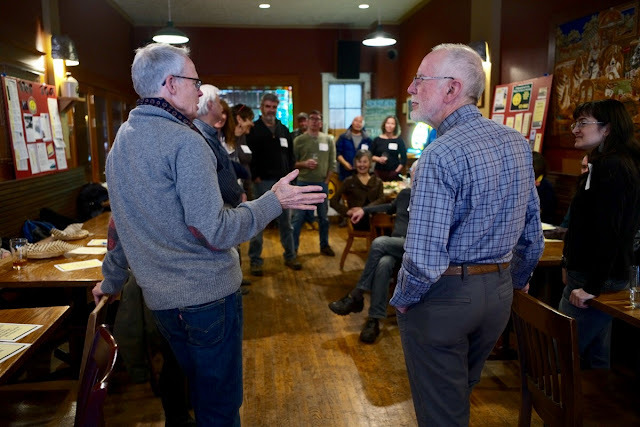 Not able to attend the party but mentioned by many was Dr. Richard Katzev, Reed College psychology professor at the time, who inspired us and conducted the first independing evaluation documenting the benefits of carsharing to US cities. Dave getting nostalgic after a beer at the Lucky Lab brewpub. 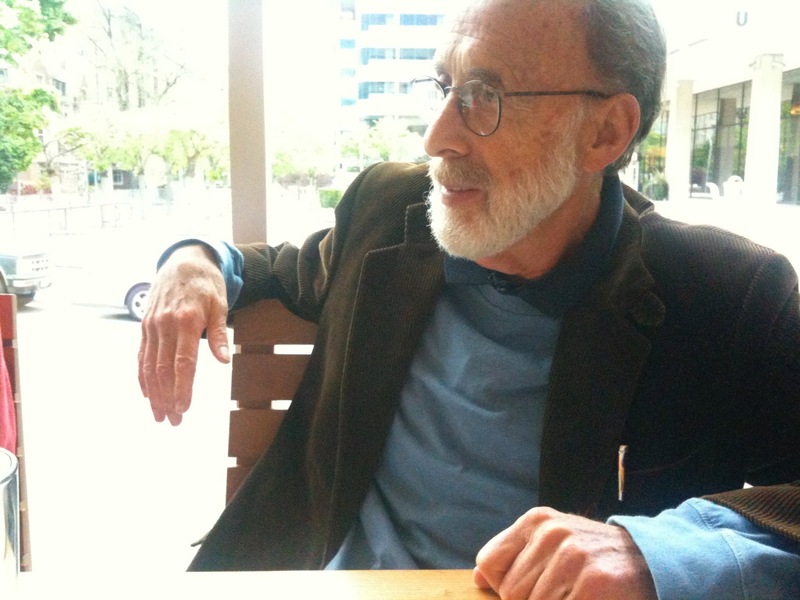 And a final photo of one key person from the early days of carsharing (who wasn't located before the meeting) - Clive Bullian, whose started out cleaning cars and quickly became an invaluable all around fleet person. His easy going attitude boosted everyone's spirits and got the job done. 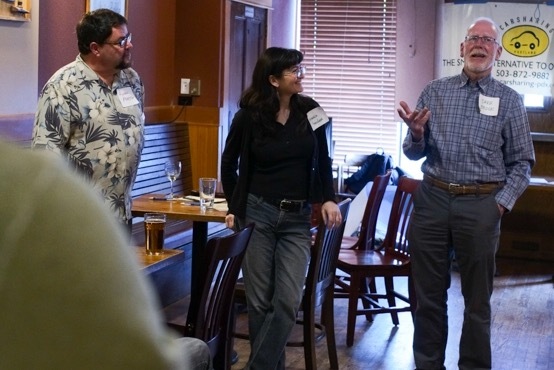 Come celebrate the launch of CarSharing Portland on April 2, from 5 to 7 pm at one of our original member appreciation and recruitment venues - the Lucky Lab Brewpub, 915 SE Hawthorne. I'm digging out some historic documents and artifacts from the early days of carsharing to display at the event. If you have some photos, artifacts or memories of the early days of CSP or Flexcar send them to me and I'll post them here. 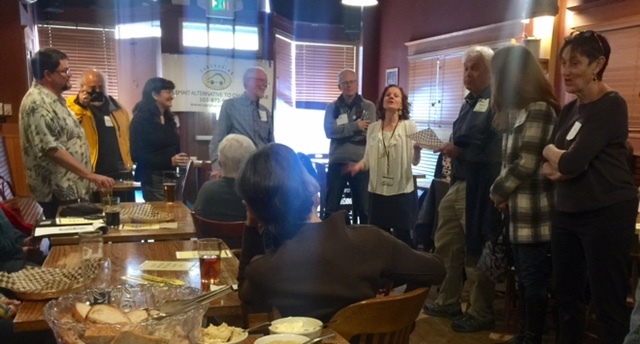 And if you're in Portland on April 2, come to a little party at one of our original member appreciation and recruitment venues - the Lucky Lab Brewpub, 915 SE Hawthorne, between 5 - 7 pm. Parking is a hot button issue in cities. Cities have been providing free (and underpriced) on-street parking since the advent of the automobile, and, no surprise, people like FREE, even when it's a scarce resource and they have to cruise for it! Making it even harder, is the perception that politicians are "taking away" public parking and "giving" (or even selling) it to private carshare companies, especially when the parking space is in front of your home or business — even though the private company is serving the residents of the area! 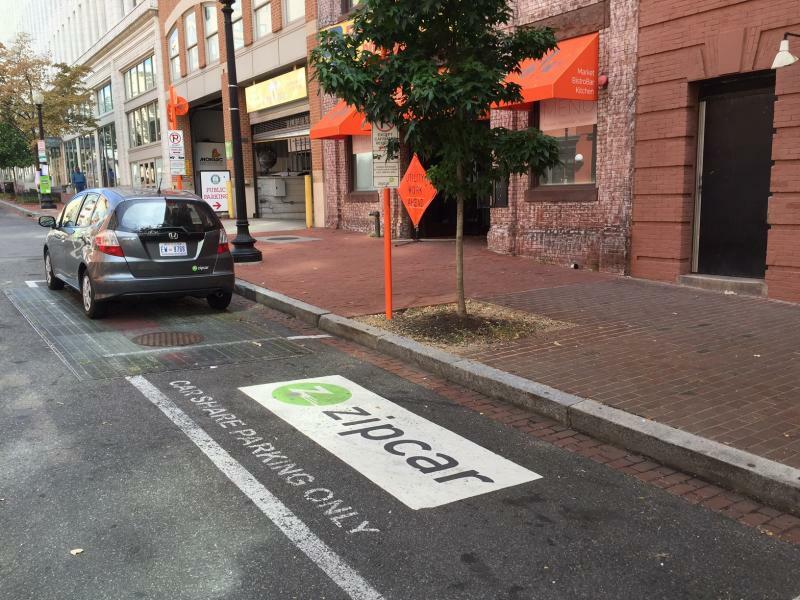 Consequently, it can be hard to get a city to designate on-street parking for carsharing. (In this posting I'm talking about reserved on-street parking for "round trip" carsharing services. One-way/free floating carshaing is a related but different issue.) The way these policies are implemented in each city depends on specific verbiage in the city's legal code framework. Good general overview of reserved on-street parking for carsharing. - Same as above but build in some sort of revenue-sharing mechanism when the operator meets some threshold. A detailed discussion of how Denver is implementing carsharing parking. The "Mobility Hub" concept places carsharing vehicles at/near other transit services, such as bikesharing, subway stations and major bus interchanges. This describes the efforts by the City of Bremen, Germany in integrating carsharing in the overall transportation network of the city. A detailed discussion of where carsharing fits into the overall parking management strategy. Hope these are useful. Let me know if there are other articles or website you've found useful. 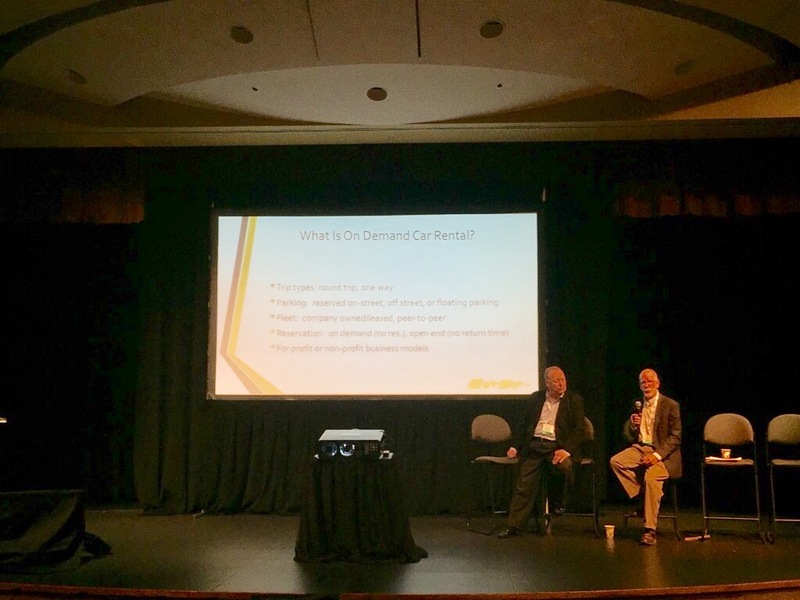 Earlier this month I was a speaker at the Connected & Autonomous Vehicles Conference, part of the larger Internet of Things World Conference in Santa Clara, California, May 17, 2017. I was on a panel discussion introducing shared mobility with Steve Messino, CEO of MuvMe, a carsharing/on demand car rental platform provider. I'm skeptical about how fast the conversion to autonomous vehicles is going to happen, so I was interested to hear from a number of other speakers in the autonomous vehicle industry saying the same thing at other sessions. There are all sorts of issues to be sorted out - highway regulations and insurance are two big ones and in the US. And these issues will have be figured out on both the national and state by state levels, and probably some cities will want to regulate them, as well. What did you learn about autonomous cars at the conference? I've been skeptical about soon autononmous cars are going to become widespread. I just saw one this morning saying it would be, "within 5 years". Well, okay, maybe on certain highways, but not widespread. It's not because of technology or availability of insurance, but because there are so many regulatory challenges to figure out, at least in North America — the federal government and each state have to implement laws, insurance commissioners in each state have to go through a process. I don't see it happening on a widescale basis for at least 10 years. Something that really surprised me, as much as I hate to admit it, is the awareness of carsharing at the conference was pretty low. We are still more niche to the general public than we realize. But everyone seems to know about Uber and Lyft and their ultimate plans to switch to autonomous cars. It wasn't until after the conference I read this really wonderful quote from Gregory Ducongé, CEO of Vulog that would have helped people at the conference understand carsharing, "It's Uber without the driver, and it's much cheaper." There was one whole session devoted to insuring self driving cars which I found very interesting because it reminded me of my own experiences in the early days of carsharing. I don't see insurance as the challenge some of the speakers did. Carsharing pioneers in every country face the challenge of finding an insurance company to provide coverage and AV pioneers will are facing the same thing. But I think the experience of peer to peer carshare companies suggests that it might actually be easier for autonomous vehicle companies to get insurance because the scale of AVs is so much greater than a little carshare start up, and scale is what insurance companies are looking for to provide a cushion against big claims. It wouldn't surprise me if AV insurance had a pay-by-mile (or kilometer) component, as well! Perhaps the most fundamental insight about the future of autonomous vehicles didn't come from the conference at all but from an article several months ago in Atlantic Magazine's excellent CityLab website. It said that AVs could lead to either a transportation "heaven" (if the AVs were shared) or "hell" (if privately owned) due to increased congestion and VMT. The distinction between car rental and carsharing will be blurred even more. Car rental companies on every continent are already offering classic carsharing services - EuropCar, Orix, Enterprise, to name a few. And car rental companies are increasingly installing telematics in vehicles to enable on-demand rental to provide greater convenience to their customers, allowing them to bypass the checkout counter. This would allow car rental companies to set up remote unattended lots in less dense areas to facilitate neighborhood rentals. Just add insurance and refueling and you have carsharing. New Entrants — OEMs won't be only ones getting into shared mobility. We've recently seen automobile clubs offering in the one-way services (Evo in Vancouver, Gig in Oakland) and it seems possible that insurance companies and others in the transportation sector may start providing mobility services, such as last mile services to trains. One-way carsharing systems will become the dominant player, serving both round trip and point to point trips. In cities where on-street parking is not too difficult, the same fleet can easily serve both types of trips and it will provide better utilization of the fleet. In cities with limited on-street parking, companies may do it with separate but overlapping fleets, using some one-way vehicles to satisfy weekend demand. I'm sure we'll see many other possibilities as the personal transportation sector is in huge ferment right now.